Bats in my belfry reviews prompts me to thank all and sundry. Bats in my belfry reviews prompts me to say many thanks to all and sundry. You're too kind! This page was last reviewed by Bernard Preston on 1 December, 2018. Bernard Preston is a natural story-teller. Here is a wonderfully light-hearted look at the daily life of a chiropractor as he deals with setting up practice in a foreign country, dealing with the language, lifestyle and some tricky clients! This is not a medical book about bad backs, but it does give a good insight into chiropractic methods. Preston's joy of seeing patients re-gain control of their lives after treatment is thought-provoking, so I've recommended this book to friends and family members - some of whom have back problems, and a sense of humour! This book is thoroughly recommended, as are the author's other books - all of them great reading! Now also for a fraction of the price in one minute, starting now, on your tablet, smartphone or Kindle. Only $2.99. and practice of chiropractor Bernard Preston. Focused in the main on amusing, sometimes tragic, anecdotes from the practice, these inspirational stories cover the whole gambit of his hobbies and interests. 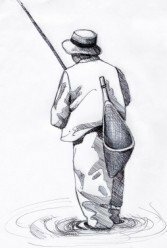 Flyfishing, carpentry, beekeeping, gliding, gardening and indulgent healthy eating. Lorraine too makes a contribution to Bats in my Belfry reviews ... see lower down. "I am looking forward to your third book. I really enjoyed reading the other two! They make you think, laugh and relax just like a good book should!" 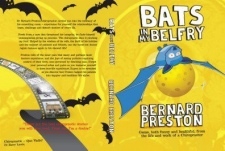 I have just finished reading Frog in my Throat and Bats in my Belfry by Dr Bernard Preston, DC; this is my first review. Great reads, I have started using some of the advice in my practice. I have learnt to be more strict with my patients, with generally positive results. I think all we chiros could benefit from other practitioners' stories, these books have opened my eyes to potential problems that I might not have thought of. I am now better prepared to look out for signs and symptoms which are perhaps not usually on our top 10 list. The best was the 'I thought it would go away' sign - I am going to get one of those for my wall. Siobhan Wilcox, South Africa. Meant to tell you that I have just read "A Bat..." again. The first time I read it, I seemed to have a lot of things on the go and so read it fast. But have now slowed down and read it properly. And enjoyed it a lot. Lorraine Gerber, Ashford. There has been wonderful feedback from the students at WIOC regarding Frog and Bats and I have encouraged them to ask their principal chiropractors to stock them in their clinics for patients to buy for themselves or as gifts. I also read the glowing review from Michelle Wessely in the Back-Space magazine. Marty Timchur M D, Glamorgan. "Everyone, in some small sacred sanctuary of the self, is nuts." and I'm not so sure about you!" I have been enjoying Bats in my Belfry thoroughly, almost finished it! Well written. Mike Buchholz, Johannesburg. I thoroughly enjoyed your lecture last November and bought a copy of your book "Bats in my Belfry". I really enjoyed it and so did my wife - who thanks to you now has a much better idea of what clinical life is about. Mark Walles, Bournemouth. Good luck with the book promotions - I think that Bats in my Belfry is a great book ! Students should take sometime out to give it a read as there are some valuable lessons that they could learn. Dr Charmaine Korporaal, Durban University of Technology (Chiropractic). How I enjoyed your book, I could hardly put it down. Kathleen Mack, Valley of the Thousand Hills, South Africa. 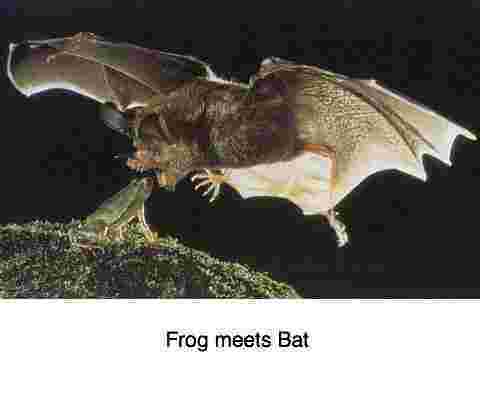 Thank you for all the pearls of wisdom - I really enjoyed the Frog in my Throat book, as well as the excerpts from Bats in my Belfry. Dr Neil Stakes, Singapore. You are a talented writer. Good reading. Dr Warren Hammer, Connecticut. I enjoyed Bats in my Belfry and was drawn to keep reading chapter after chapter. I gave my copy of the book to my chiropractor and he commented that he now had some insight into another chiropractor’s perspective. Some of the book was heavy, the silent weekend. Some of it was suspenseful, the gliding journey. Some of it was sad/frustrating, Sipho. I started to wonder when I read the car incident story about how it can't be possible that all these events could happen to one person in a lifetime. Maybe I just haven't "lived" enough yet! Clearly Dr Preston has had many interesting stories to tell in the book, but I think that putting them all together and drawing the thread between them was the challenge he faced. Is a book a success if the author grows as a person while writing it? Or is it a success only if many other people can find the book and enjoy reading it? Kevin L, Chicago. Bernard Preston’s two novels came as a delightful surprise. I have just finished reading Bats in my Belfry...and enjoyed it very, very much! He has a refreshingly natural flair for story-telling. His style is relaxed and easy to read, giving us a delicious peep into the daily life of a chiropractor– I’m looking forward to his third book. Lorraine Harrison, Kent. The reason for me wanting to give copies of Bats in my Belfry as Christmas presents is that I know there are several people in my family and also friends who would find your book a good read (some with back problems and a sense of humour!). Linda Harris, Cornwall. I thoroughly enjoyed Bats in my Belfry! More, I think, than 'Frog'. I used it as bedside reading. Steve Pillinger, Thame. I’m bleary eyed this am! Your book, Bats in my Belfry, has kept me up half the night! My wife is complaining about you, she can’t ever remember me doing that before. It’s a pot boiler! Dr Tom Rapp, New Jersey. Bats in my Belfry is the fascinating autobiographical tale of Bernard Preston’s life and work as a chiropractic doctor in South Africa, his varied relationships with his patients, friends and family, and the pros and cons of his profession. It is at once scientifically informative, funny, sad, poignant and very, very human. What is so appealing about this book is that the reader feels very much included in the story as Preston ‘invites [us] into the intimacy of the consulting room’, and of his personal life. He writes with endearing honesty about his life and work, and this frankness means that at times, he delves into the darker recesses of his own personality in an almost confessional manner, so that the reader takes on the role of quasi-confidant as well as spectator. From his attraction to a beautiful but underage girl (though he was cleared of professional misconduct) that makes him question his role as a chiropractor, to his solid if sometimes troubled marriage to Helen and his tendency to drink too much, the story shifts between the high and low points of Preston’s life and career, including conducting his business from home, disagreements with colleagues, difficult diagnoses and his realisation that his work is not just a job, but a vocation. Since this is very much a ‘people’ story, it is not surprising that the characters who populate it are one of the book’s most memorable aspects, from Bernard himself (open-minded, willing to learn, aware of his own weaknesses as both a chiropractor and a man), to colleagues such as the tough, gorgeous and egotistical psychologist Sandy MacDonald, and patients including feisty, scheming Mrs Boucher (who is caught by her own ‘mantrap’), decent, kindly old Mr Piggott and the gifted but emotionally chaotic John Junior. Though he is a scientist by profession, the author can be quite poetic in his writing style, employing some lovely lyrical language to often dramatic effect, especially when he is scene-setting (eg ‘the first tinges of salmon pink fingered the mountains’; ‘when the early Spring weather layers the highlands with a thick blanket of snow’; ‘all the males in the audience fell into the lap of her seduction’, etc), and using subtly mocking though never wicked humour (eg Jean Piggott has a face ‘that I could compare to the snowy mountain sky rather than a summer’s day’). There is also something of a screenplay/script-like feel in the frequent use of dialogue that pushes the story along, side by side with Preston’s narrative voice, in which he sometimes creates a pleasing sense of distance (eg ‘Bernie thought so, but Bernie was wrong,’ he says of himself). Structurally, the individual stories are episodic yet linked by the common thread of Bernie’s life, and there is a strongly anecdotal feel to the book as a whole. There is little to criticize in this very well crafted and written book. However I did feel that some of the ‘shop talk’ was a little overdone in places (eg the discussion about x-rays between John and Bernie in Chapter 2), though the descriptions of the actual chiropractic procedures are very interesting, even to the lay reader. Otherwise, only odd typos/misspellings would need to be corrected (eg ‘lightening’ for ‘lightning’; ‘unskillfully’), as would occasional misuse of punctuation (eg ‘listening intently to the Piggott’s story’) and some minor repetition (eg ‘By day Sandy was a psychologist by profession’). Perhaps a brief Afterword to follow the ‘Holland’ chapter (24) would be a good way to neatly round off the story. Overall, this really is an absorbing tale that is a good read in terms of both content and style. As it entertains, one gets the feeling that it is also something of an act of catharsis for the author himself. Bats in my Belfry has been completely re-edited by a professional editor supplied by the PenPress since this report. 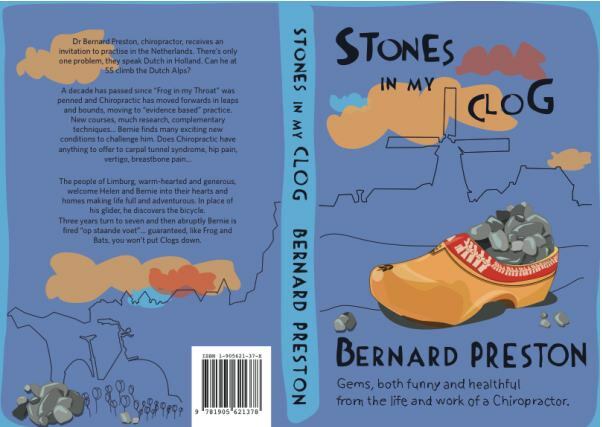 Bernard Preston's third book is centred in Holland where he spent seven years practising. There too he found an avid readership, this for our Netherlands friends... thank you, Mr Maas, can you imagine getting the painful neck of the year from a judo move at 68? Ondanks een eenmalig geweldig! bezoek aan Zuid Afrika, compleet met een korte rit op een struisvogel, weinig ervaring met Zuid Afrikanen. Maar als de twee die ik dan wél wat grondiger ontmoette typerend zijn voor dat deel van de mensheid, heb ik wat gemist. Betreurde ik het vertrek van de ene, in wiens - notabene door een fysio-therapeut aanbevolen - chiropractische handen ik viel (je weet wél wat je hebt, níet wat je krijgt), bleek de opvolger óók weer een schot in de roos. Blijkt het eveneens weer een man met meerdere, jaloersheid opwekkende kwaliteiten. Schrijft - náást zijn medische steunverlening aan de medemens - ook nog boeken. Bats in my Belfry. Frog in my throat. Gems both funny and healthful from the life and word of a Chiropractor. Nieuwsgierig een blik in geworpen. De paar zinnen die ik las prikkelde mijn gevoel voor humor en wekte mijn belangstelling. Dús maar aangeschaft; wél uiteraard met een lichte irritatie omdat het de kosten van het consult niet-declareerbaar verhoogde. Naar ik meen begrepen hebben zijn er artsen met de beroepsdeformatie inhoudend dat zij moeite hebben om in de hernia of de hersentumor de mens te blijven zien. Bernard Preston's professie komt in ieder hoofdstuk voor op op een wijze die in het voorbijgaan tevens onderwijzend en overtuigend ïllustreert dat chiropractie bepaald GEEN kwakzalverij is; maar hij doet dit met een boeiend verhaal over nu juist de mens die het probleem heeft. Voor de niet met de medische terminologie bekenden is er dan nog een beknopt medisch woordenboekje achterin. Niet altíjd onder de indruk van de goed bedoelde wijze waarop sommigen hun naasten pogen te behouden voor Gods eeuwigheid, komt er dan óók weer verrassend, een even boeiend leesbaar hoofdstuk met als strekking, dat je voor het oerknal verhaal als verklaring voor het ontstaan van de aarde nog meer fantasie moet hebben dan voor het geloof in het bestaan van een Opperwezen (Intelligent design). Heel herkenbaar voor de meeste lieden die zich professioneel bezig hielden met opblazen van zaken waarbij tamelijk algemeen alleen maar een geweldige vernieling tot stand komt. Adem inhouden bevorderend (hoe loopt dit in vredesnaam af) wordt de lezer op de eerst blz al in technicolor meegenomen naar de reputatie slopende scene, dat een patiënte de schrijver in een volle wachtkamer aan haar man aanwijst als degene die verantwoordelijk is voor de baby bundel in haar armen!!!!????. Verder op in het boek blijkt pas - heel clever - hoe het nu ECHT in elkaar zit. Lezing Aanbevolen. En een ieder die een chiropractor nodig heeft zal in de man achter het pseudoniem een waardig en boeiend vertegenwoordiger van de medische stand treffen. De lezer een lang leven toewensend, zonder de noodzaak een chiropractor of andere artsen nodig te hebben. From Bats in my Belfry reviews to BERNARD PRESTON home page.